There will be a Hunter Safety Class the first week of May at the Santa Ynez Sportsman Club off Hwy 154. This is not a Central Coast Hunting Retriever Club event and is brought to you by the 2nd Amendment Gun Shop in Santa Ynez. The dates are May 5, 6, 7, 12. The 5th, 6th and 12th class is from 6:00pm to 8:30 pm. On the 7th the class will be from 2:30 to 6:30 pm. The class is free, the only requirement is to finish all four classes. Class is limited to 20 students so if you are interested be sure to contact soon. Please contact Gabriele Santi at 2nd Amendment Gun Shop to sign up. Charles is offering digital copies of images for $5 each when a print of the same image is ordered. The resolution will be 900pix on the longest side at 72dpi. These are for web use and are not print quality. If you wish to purchase stand alone digital copies and not order any prints, the price is $10 each. If you are interested in purchasing photos, the easiest way to make a payment is by using Paypal. You don't need to have an account; all you need to do is use the following email address alydar_1978@yahoo.com as the recipient. Along with your payment, please include the file numbers, the sizes of the photos you wish to purchase, and your contact information (name, address, phone number etc.). Charles will contact you to confirm your order and I will mail your photos after they are processed. You will usually receive prints in the mail within two weeks or less. Digital files will be emailed to you within 48 hours of purchasing. For this event, photos from Saturday are named CCHRC_SAT_101 etc. Sunday's photos will be named CCHRC_SUN_101 etc. Accuracy of the file name you wish to purchase is of the utmost importance. Please double check to avoid receiving the wrong images. Processing time will be approximately two weeks after your check is received. Any photos that are ordered will receive special attention. If an image appears to be too dark, too light, or the dog or handler have shadows over their faces etc., Charles will correct such things before the image goes to print. The prints will look better than how the images appear online. If you have any questions please feel free to email Charles at alydar_1978@yahoo.com or call him at 818 389 5963. 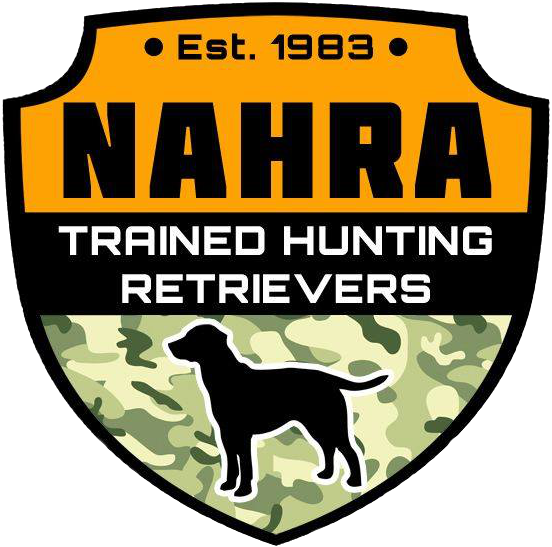 Central Coast Hunting Retriever Club is pleased to announce that Mud River Dog Products has donated to the 2011 NAHRA Hunt Test at Camp Roberts and has become a sponsor of Central Coast Hunting Retriever Club. Please support our sponsors’ by considering their products when looking for hunting and training supplies. Meeting minutes for our February 16th meeting are now available for member review in the documents section of our website. 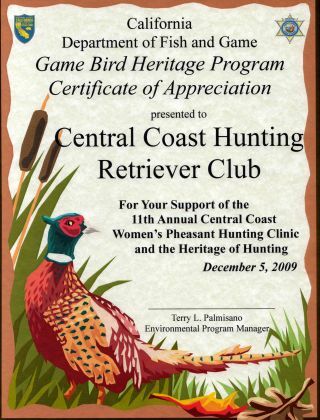 On December 5, 2009, CCHRC participated in the California Department of Fish & Game's 11th Annual Women's Pheasant Hunting Clinic on December 5, 2009, as both participants and as dog handlers. If you are interested in learning more about this event, contact our club at cchrclub@gmail.com.